The largest quantities are from the brand "MM". The cigarettes are transported by mules. Turkish police came across 600,000 boxes of smuggled cigarettes during four specialized operations to counter illicit trafficking of goods in the southeastern province of Diyarbakir. The market value of the large shipment amounts to 2.5 million Turkish lira (775,000 euro). The brief message of the sector for combatting smuggling and organized crime emphasizes that the cigarettes have arrived through illegal channels and their import is definitely illegal. The trucks and vans carrying the goods were tracked and stopped for inspection at the entrance of the city of Diyarbakir. Much of the stacks were hidden in tea set boxes. It was established that the seals on the Customs documents were falsified. Five individuals were arrested. According to initial reports, most of the smuggled cigarettes are from the Bulgarian brand “MM”. The information about this discovery of the Turkish authorities is dated March 24, 2016. Just three days earlier, again in Diyarbakir, 682,500 packs of cigarettes with market value of nearly 4.095 million Turkish lira (1.2 million euro) were found in six tractors and seized. According to a statement of the local Prosecutor’s Office, one man was charged and jailed with a Court decision. On October 23, 2015, the close-to-the-government newspaper Sabah reported a defeating blow to the illegal trafficking of cigarettes. The “catch” from the operation in Istanbul was the impressive 1.6 million packs, worth 10 million Turkish lira (3.1 million euro). The newspaper’s brief message stressed that this was related to an international organized criminal group that uses cigarette smuggling to finance the declared as terrorist Kurdistan Workers’ Party (PKK) and its affiliated separatist formations. Traffickers show ingenuity when it comes to transporting their goods. On March 12, Star newspaper wrote about a 54-seat passenger bus with half of its seats being dismantled and having an internal mirror barrier transporting 70,000 packs of cigarettes from Van to Kayseri – also areas in Eastern Anatolia. It was established that four years earlier the same bus has suspended its contract with the company whose logo was written on it. On February 15, a check of a heavy tractor trailer yielded 145,000 packs of cigarettes, hidden under pallets with glass, transported illegally with falsified Customs documents. A day earlier, two parallel police operations in the province of Sanliurfa near the Syrian border seized 184,500 packs of cigarettes. Three people were arrested. Some of these packs were found hidden in a tractor trailer between food cans, others – during a search of a private home. On February 13, also in this area, 164,500 packs of illegally imported cigarettes were seized from a truck traveling to the administrative center of the city of Van. The picture with the truck’s open bodywork once again shows our home brand “MM”. Turkish media – government, pro-government, opposition or independent, constantly keep in focus the intense smuggling of large cargo of cigarettes and emphasize the fact that the share of the Bulgarian production, entering the country and the market, is too large. This is because in southeastern Turkey the illegal trafficking of goods and tobacco is flourishing. About two weeks ago, Balkanlar published the “arithmetic” of the transfers carried out by mules – real animals for which the wild and steep mountain areas obviously no obstacle, even with heavy loads on their backs. In that publication, the website refers to the State Anatolia News Agency. “One of these animals can carry about 3,000 boxes of cigarettes that are purchased for 2 US dollars each, but after the smuggling in Turkey, the sale price per pack rises to 4 Turkish lira (1.24 euro) and the profit only from one animal reaches 9,000 Turkish lira (2,790 euro). Assuming that an average of 500 mules cross the Syrian-Turkish border daily, just in one day the traffickers share among themselves a profit of 4. 5 million Turkish lira, or 140 million Turkish lira (43 million euro) per month. PKK charge on average 100 US dollars per animal and thereby the Kurdish separatists earn 4 million Turkish lira per month and have an annual income of up to 1.2 billion Turkish lira,” the Anatolia News Agency, quoted by the site Balkanlar, claims. The fee is much higher for trucks, which carry larger loads. It must also be pointed out that every family in southeastern Turkey has four-five mules and earns at least 15,000 Turkish lira per month through this business. Authorities, secret services and ordinary Turks alike, know that the path of contraband cigarettes goes through the Customs paradises of Dubai, the United Arab Emirates and Doha, Qatar. A while ago, Bivol, in a series of publications, revealed the Dubai connection of the lawmaker from the party Movement for Rights and Freedoms (DPS), Delyan Peevski, whose mother Irena Krasteva is the majority owner of Bulgarian tobacco maker Bulgartabac (see here, here and here). Since then, the situation has escalated. Peevski sporadically “moves” the public with his personal business “break-ups”, and last week Bulgartabac announced that it was stopping exports to the Middle East, which generate 80% of the income of the company from export. 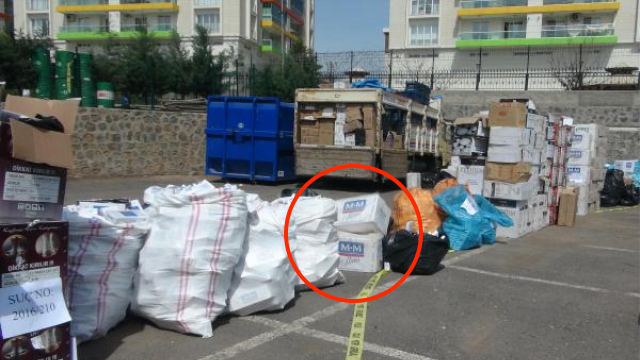 An investigation of the Turkish daily Milliyet from May 2015, cited by Bivol, suggests that much of the contraband cigarettes in Turkey were produced in Bulgaria by Bulgartabac. The Turkish newspaper refers to the detailed report of the country’s Ministry of Customs prepared together with the financial intelligence MASAK. Approached for comment, MASAK did not deny the information, but explained that they are not authorized to provide a copy of the report. According to this report, smuggled cigarettes arrive in Turkey from Georgia, northern Iraq and Bulgaria, while large sums of money are transferred through exchange offices from the eastern parts of Turkey to Istanbul in accordance with the smuggling activities. Furthermore, close links are detected between some of the smugglers and wings of the outlawed in Europe Kurdistan Workers’ Party (PKK), states the same report. A large amount of cigarettes are smuggled from northern Iraq, Georgia and Bulgaria to the southern province of Mersin, as well as to several eastern, Black Sea and southeastern provinces before being distributed throughout the country, mainly in Istanbul. The most common brand on the market of smuggled cigarettes is owned by the Bulgartabac company that sells cigarettes under the brand Prestige to Salam Quadir (Quader)Faraj in northern Iraq, the report said. According to a report of the Turkish intelligence, cited by the newspaper Turkiye under the headline “Bulgarian Contraband Cigarettes Fill PKK Coffers”, the Kurdish separatists are funded namely by the illegal trafficking of cigarettes and drugs. These funds are invested in weapons and ammunition. In 2015 only, 143,239,425 cartons of cigarettes imported through contraband channels have been seized in special operations in the provinces of East and Southeast Anatolia. The majority of the illegal tobacco import is manufactured by Bulgartabac, says the paper, and underlines that from Bulgaria the cigarettes are transferred to Dubai, hence traffic passes through northern Iraq and Syrian border areas, then they cross the border illegally in the eastern and southeastern provinces of Turkey and reach the domestic market. Information on the Dubai ownership scheme of Bulgartabac and the role of Salam in it was published as early as March last year on the site of Bulgarian financial journalist Miroslav Ivanov. The scheme, accompanying a letter of attorney Angelov to banker Tsvetan Vasilev, clearly shows that the real ownership is divided among several offshore companies and the major shareholders are Delyan Peevski’s mother – Irena Krasteva, Tsvetan Vassilev and the alcohol producers from the company Peshtera JSC. Three offshore companies, behind which stand current Bulgarian Prime Minister Boyko Borisov, the close to him businessman Alexander Staliyski and the DPS Lifetime Honorary Chairman Ahmed Dogan each hold 8.5% of the shares. This is stated in a letter sent to the US Embassy in Sofia and published by Bivol. It describes in detail the privatization scheme of Bulgartabac and the trafficking of cigarettes to the Middle East. Bivol recently published documents showing that Salam Quadir Faraj has been the official distributor of Bulgartabac products since 2004, but by 2011 had lost its license for the import of cigarettes in Iraqi Kurdistan because of forged documents. In reality, Bulgartabac has partnered with a recognized smuggler and this fact was known to the company that has continued to sell large quantities of cigarettes in violation of international trade agreements. However, Bulgaria’s Prosecutor General, Sotir Tsatsarov, told reporters that neither his institution nor the State Agency for National Security (DANS) had received information on traffic of Bulgarian cigarettes, produced by Bulgartabac, to Turkey. Prime Minister Borisov said on his part that he was not aware of Delyan Peevski being behind the ownership of “Bulgartabac”.